Is your closet a mess? Does it need a makeover? If you want to organize your closet on a budget, I’m about to show you some DIY closet organizers that you can put into place this weekend! There’s no need to put it off any longer. The time to spruce up your closet is now. First, start with these 5 tips for organizing your closet. Next, determine which closet organizer you’ll use. Design and build your own closet organizer from scratch yourself. Install pre-designed closet organizers that will fit in any closet. 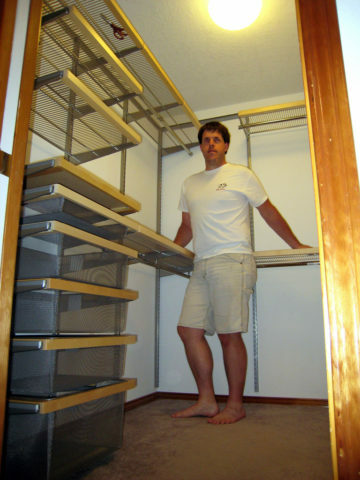 Even if you don’t have that custom his & hers walk-in closet you’ve always dreamed of, you can come pretty close by designing and installing some new shelving yourself. If you are the handy type, here are some step-by-step instructions on how to build an attractive closet yourself. You will use some very basic skills in carpentry while working with wood, a circular saw, and a few hand tools. Start with these tips to design your own closet organizer. 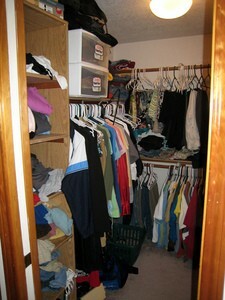 Professional closet organizers’ websites have everything you need to design your own closet shelving layout. Each website walks you though the many options available to you — from finishes to floorplans. Most provide a detailed installation guide, as well as the option to let them install a closet layout that you’ve designed. If you don’t feel quite up to the task of building a designer closet yourself, there are lots of shelf systems, adjustable rods, and closet organizers that you can buy online and in stores. In my opinion, the easiest way to organize a closet yourself is to use rolling garment racks and accessories that you can move around as you need. There are lots of storage & organization products that can be used in this way. 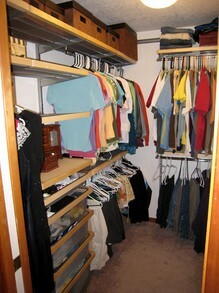 For example, you could place a rolling pant trolley underneath shirts for an instant 2-tier closet! There are also lots of stackable modular storage units that you can put in the underutilized spaces in your closet. Whenever you see a clothing store is closing its doors, go in and request to purchase the wooden hangers. Nothing has made my closet look more attractive and organized than getting rid of all the plastic and metal hangers! Want a simple way to keep shoes off the floor, yet organized in a closet or mudroom? Make a DIY hanging shoe rack! Purchase a low dresser and place it in your closet underneath shorter items — like shirts. You can store shoes, underclothes, or any number of items in such that dresser. Spruce Up Your Walk-In Closet: Get Organized!